"...and even if the wars didn't keep coming like glaciers, there would still be plain old death." I am more than proud to announce that this time next year I will assume the co-editorship of Crime, Media, Culture, with Sarah Armstrong (University of Glasgow) and Katherine Biber (University of Technology, Sydney) rounding out a stellar international team! November 2018: More than 50 people showed up early Thursday morning to a round table organized by Corina Medley, to hear Jeff Ferrell, Justin Turner, Corina, Rob Werth, Bill McClanahan, Michelle Brown and I talk about the new Ghost Criminology volume. Good indication that we are perhaps on to something! November 2018: my 14th consecutive American Society of Criminology meeting, the third in Atlanta. 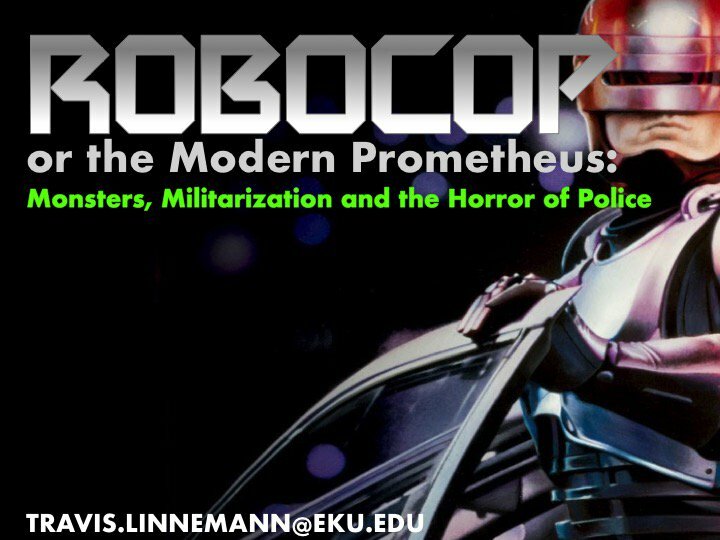 Sitting on a panel with Judah Schept, Tyler Wall, Bill McClanahan "Matters of Violence: Police, Prisons, Ecology" on this panel I presented a bit out of The Horror of Police, a chapter troubling the critique of police militarization, "Robocop, or the Modern Prometheus." September 2018: Back over to the UK, to visit Plymouth University where a gave a talk about Violence and the Police Image. June 2018: I had a great time in my go with the British Society of Criminology conference, held this year, in Birmingham. Sat on a great panel with Steve Wakeman, Nigel South and Bill McClanahan, all of us giving our take on new directions in cultural criminology. July 2018: All systems go on a new edited book project with Theo Kindynis (Goldsmith's, UK) and Michael Fiddler (Greenwich, UK) to be published by the NYUP, Alternative Criminology series. Tentatively titled "Ghost Criminology" the project looks for the hauntological in crime's affects, objects and spaces. Theo, Mike and I couldn't be more pleased with the list of contributors: Justin Turner, Corina Medley, Bill McClanahan, Eamonn Carrabine, Elaine Campbell, Michelle Brown, Jeff Ferrell, Thomas Raymen, Simon Winlow, Anthony Lloyd, Katherine Biber, Alison Young, Rowland Atkinson and Daniel Robins. With additional submissions from us three, it looks to be a weighty volume! April 2018: Good time at the 3rd Annual New Directions in Critical Criminology, held this time at EKU. I participated in an Author Meets Critics for Mark Hamm and Ramon Spaiij's The Age of Lone Wolf Terrorism and with Justin Turner presented a new paper, Three Dimensional Policeman. January 2018: Very pleased to announce my next book The Horror of Police is under contact with University of Minnesota Press! NOVEMBER 2017: New publication: Bad Cops and True Detectives: the horror of police and the unthinkable word, open access right now at Theoretical Criminology. NOVEMBER 2017: Honored to have been awarded Critical Criminologist of the Year by the American Society of Criminology-Division of Critical Criminology and Social Justice. NOVEMBER 2017: Really enjoyed getting over to Arcadia University and taking part in the New Directions in Critical Criminology symposium. NOVEMBER 2017: Had a great time giving a talk at Carleton University and hanging out with all the fine folks at the Institute of Criminology and Criminal Justice. AUGUST 2017: SAGE has release Media and Crime! I really enjoyed dropping in on Dr. Elizabeth Yardley, Birmingham City University, UK and her new podcast Crime Bites you can listen to our conversation here. April 2017: Had a great time back at ODU for the Critical Intersections in Crime and Social Justice conference where I presented Fear the Monster! racialized violence, sovereign power and the thin blue line. Very pleased to have been interviewed by Max Daly and Vice News on Meth Wars. Meth Wars has been released! November: Interviewed for a piece discussing harsh sentences for meth users. November 2016: Another great ASC, this time I was in on three papers, including my developing work on the horror of police. October 2016: I was honored to have been invited to White Faces, Black Lives: race and reparative justice in the era of a 'gentler war on drugs' at Columbia University. June 2016: Bill McClanahan (University of Essex, UK) and I have a new publication online first at Crime, Media, Culture you can find it here. May 2016: Wonderful time at the New Directions in Critical Criminology conference hosted by Michelle Brown,Robert Durand, Lois Presser and the sociology program at the University of Tennessee, Knoxville. Great presentations were delivered all around and I presented my developing work on the War on Terror, black sites and police torture: On Black Spaces: death, denial, exorcism and erasure. Meth Wars: Police, Media, Power looks to be out this fall. January 2016: My most recent article: Proof of Death: Police power and the visual economies of seizure, accumulation and trophy is available here. November 2015. At the ASC this year, I'll be presenting a chapter out of my forthcoming book, check it out. October 2015: Very honored to have been invited by Students Against State Violence at Indiana University to speak about the global drug/terror war. 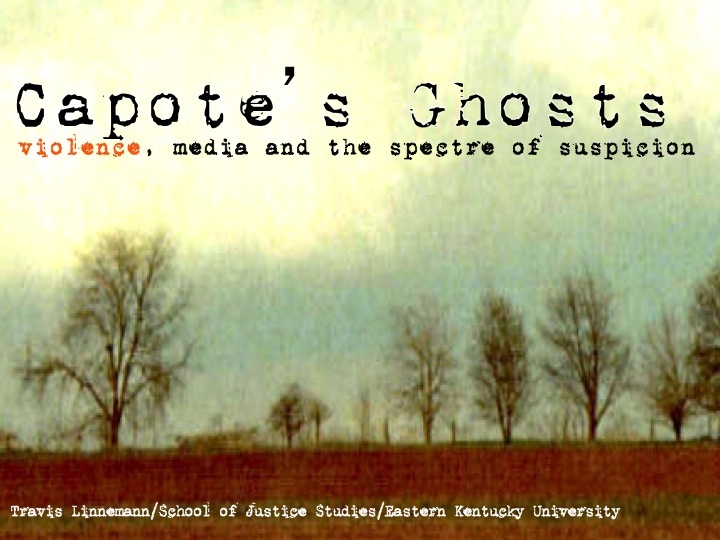 January 2015: Capote's Ghosts: violence, media and the specter of suspicion is available advance access here. September 2014: Another year, another trip to Terre Haute and the International Crime Media and Popular Culture Studies conference. This year I was a featured speaker and presented my work on Truman Capote's In Cold Blood. June 2014: 'This is your face on meth’ was selected by Theoretical Criminology for its "Editor's Choice" collection on Race and Ethnicity. May 2014: Crime, Media, Culture has published (online first) Staring Down the State: Police power, visual economies and the 'war on cameras', a collaboration between Tyler Wall and I. You can find it here. CMC. April 2014: Theoretical Criminology has published (online first): The Walking Dead and Killing State: Zombification and the normalization of police violence, written by me, Tyler Wall (EKU) Edward Green (KSU) . April 2014: I am very excited to announce that I am joining forces with Yvonne Jewkes, University of Leicester, UK to write a new version of her best selling Media and Crime volume aimed at American audiences. Available (tentatively) January 2016! February 2014: I am very happy to announce that I am joining the outstanding group of authors on the Alternative Criminology Series @ New York University Press. November 2013: I have a new article with Don Kurtz (KSU) at Critical Criminology you can find it here: Beyond the Ghetto. October 2013: I am pleased to announce I am joining the Crime, Media, Culture, editorial team as the North American Book Review Editor. September 2013: This year 8 of us made the journey to Terre Haute, Indiana to attend the International Crime Media and Popular Culture Studies Conference. May 2013: I presented "The Walking Dead and the Killing State" at the annual meetings of the Cultural Studies Association in Chicago, Ill.
March 2013: The British Journal of Criminology just published (online first) "With Scenes of Blood and Pain" a collaboration between Laura Hanson--Kent UK, Sue Williams-- the Kansas State University and I. You can find it here: BJC PUB. 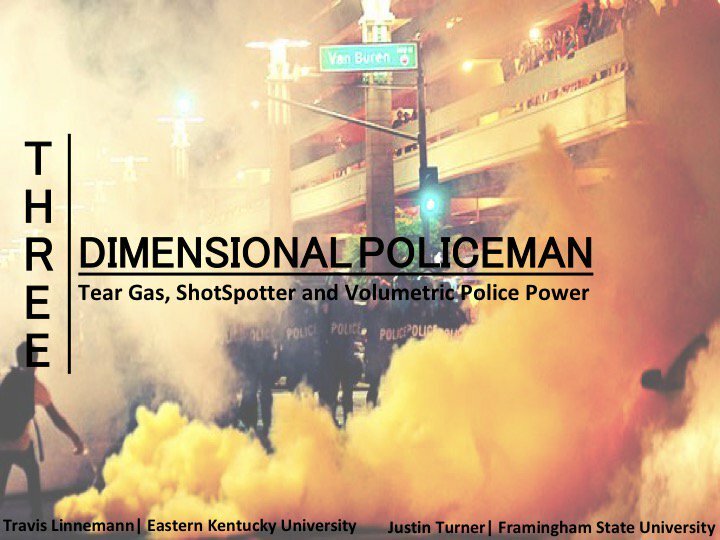 January 2013: Tyler Wall and I have a new publication online at Theoretical Criminology. ‘This is your face on meth’: The punitive spectacle of ‘white trash’ in the rural war on drugs. November 2012: As always, a whirlwind of presentations at the annual ASC meetings. This time around, I had a hand in three papers and a couple very productive round tables. September 2012: Several ODU graduate students and I just returned from the 4th International Crime, Media & Popular Culture Studies Conference at Indiana State University, where we presented several papers and took in many other wonderful presentations.